For a green thumb I have not. However, my mom asked for a few pictures of the local vegetation and I decided to oblige. For a certain value of ‘local’ of course. 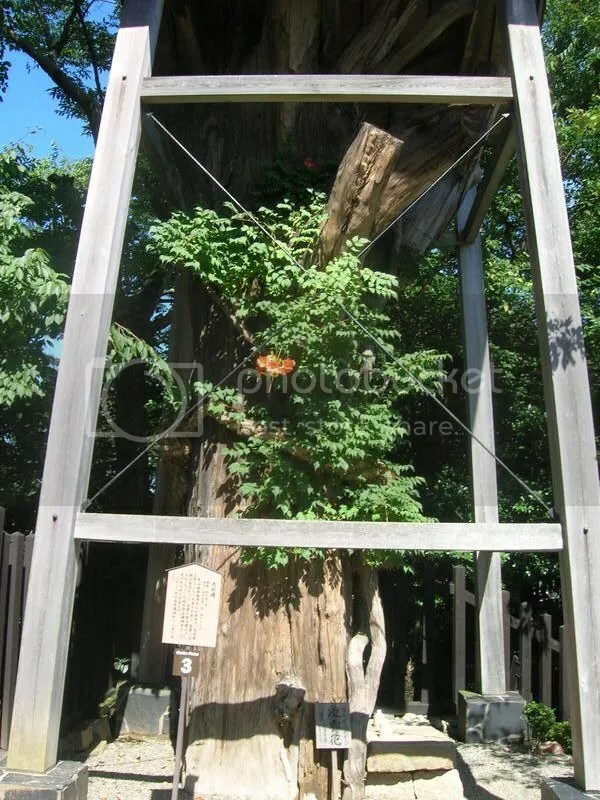 This Japanese Cedar tree in is actually in Inuyama, right up near the castle there. It was around 650 years old when it was struck by lightning in 1955. Since the locals viewed the tree as having protected the castle from damage, they decided to keep it around. I’ve mentioned before the tendency of the people in my neighborhood to squeeze gardens in wherever they could, but this one takes the cake. 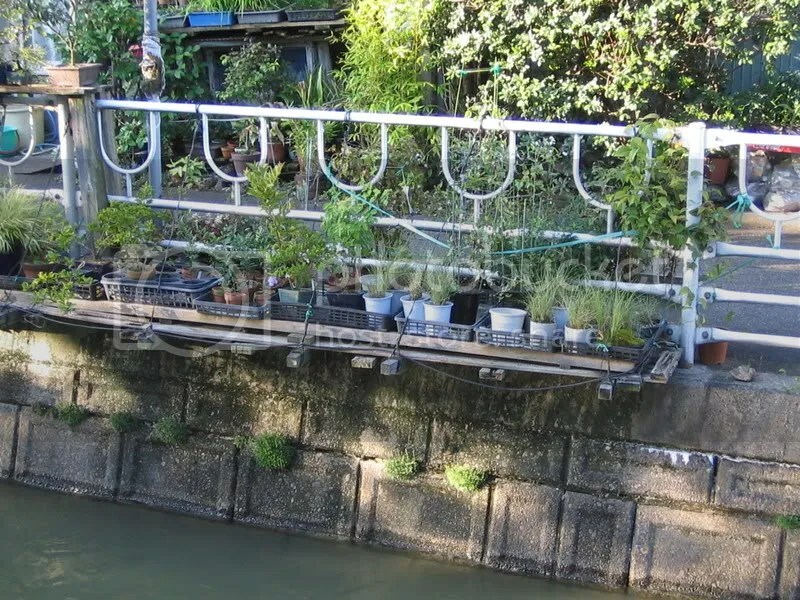 Check it out – it’s actually on a bit of platform overhanging the small canal that runs through my neighborhood. This picture was actually taken across the river from my neigborhood. 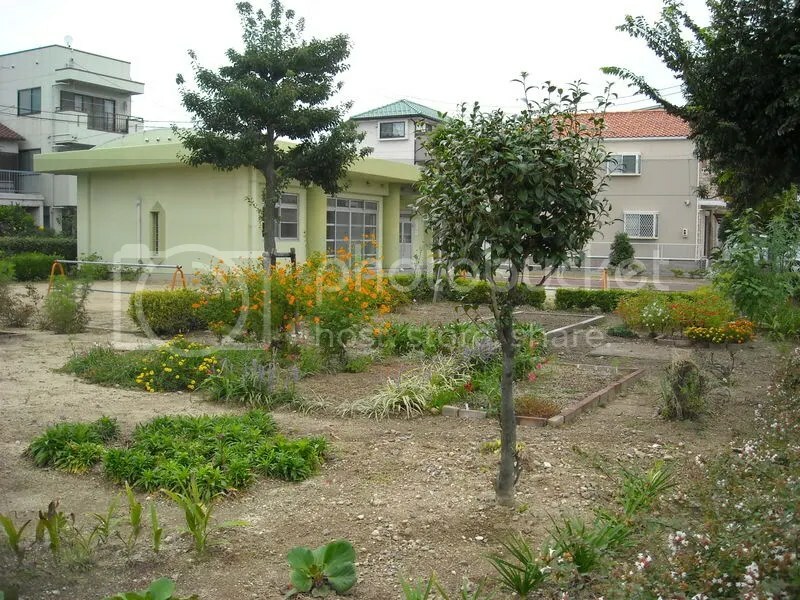 The area seemed to have a lot of community-type gardens and a few small garden/farm plots shared by the neighbors. 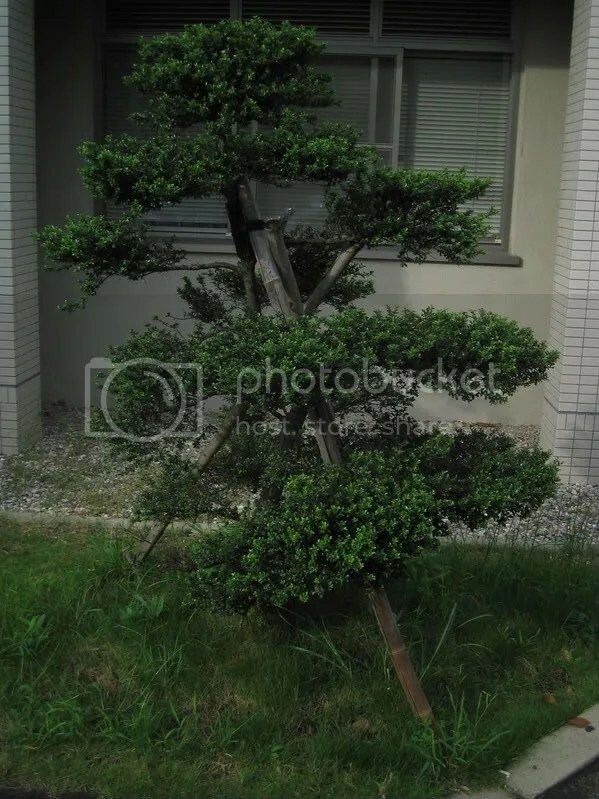 There was a whole row of these smallish trees with supports set up around them. Judging from the nearby larger trees, the supports ensure that they don’t blow over in the next typhoon or grow sideways into a building. 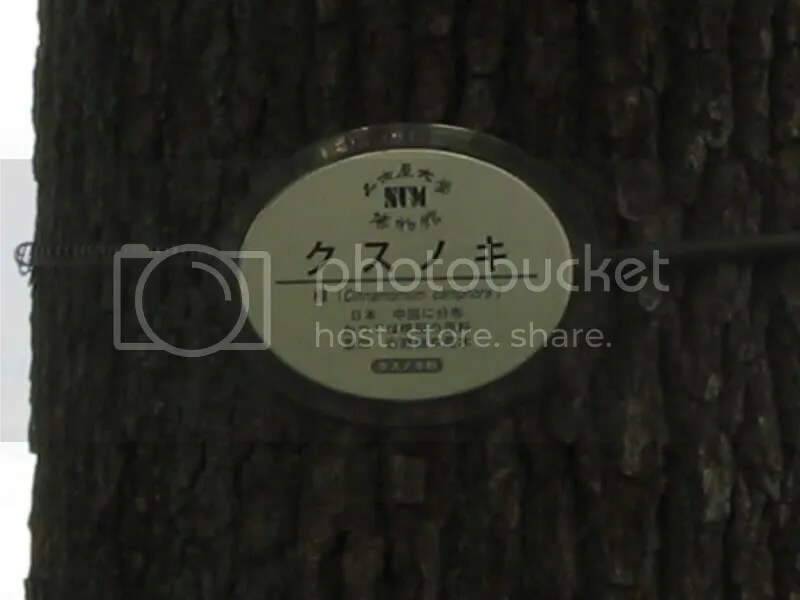 Another nifty point – a lot of the tress that are growing in parks and on school campuses (even elementary schools) have these nifty little plaques that give their names in Japanese and Latin. A close-up of the plaque. The Japanese name is Kusonoki (koo-soh-noh-kee). No idea what the means. 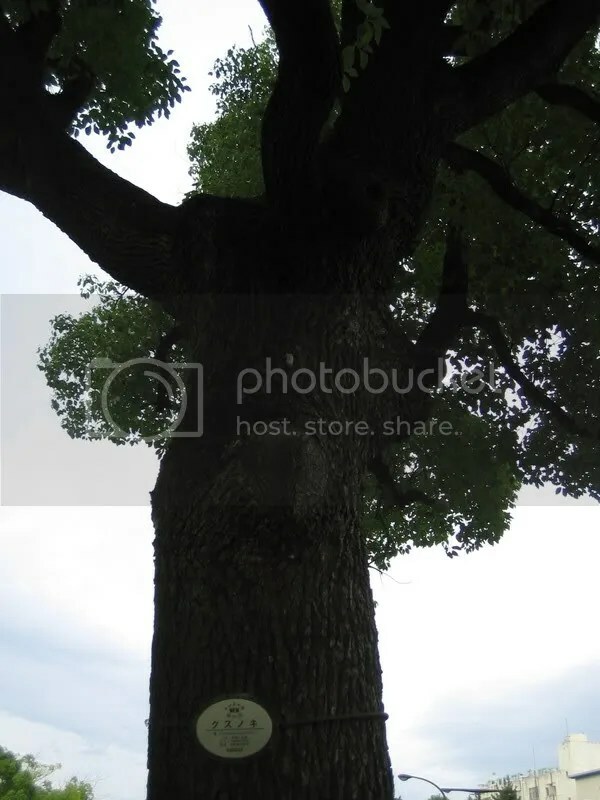 Okay, Maggie apparently looked it up and it’s a Camphor Tree. Bonus shot for the similarly plant-disinclined. This kitten is a resident of the pet shop near Nagoya Dome and I’ve taken to stopping by whenever I’m in the area. 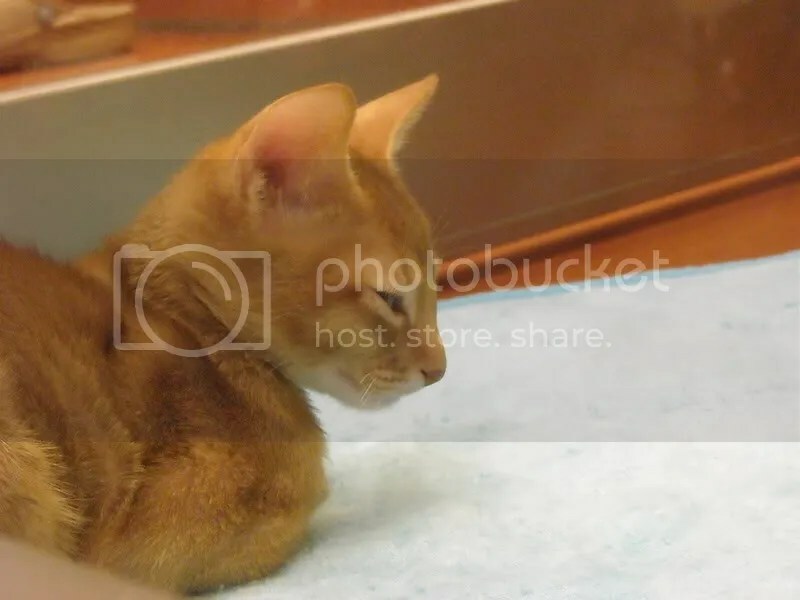 He is seriously the prettiest kitten I have ever seen – his coat is perfectly even in color and he has that perfectly slender form that screams ‘feline.’ Now, if only he didn’t cost 200,000 yen. ETA – For some reason, the computer has turned a few of these photos sideways, which is a pain, since PhotoBucket says that they’re oriented correctly. I’ll try to fix it, but until then, well, I assume you all have working necks? Some of you might have heard of so called ‘cat cafes’ which have been springing up in Asia, mostly in Japan (see here and here). When I heard of them, about a year ago, I added them to my list of ‘must-see’ locations while I was in Japan. 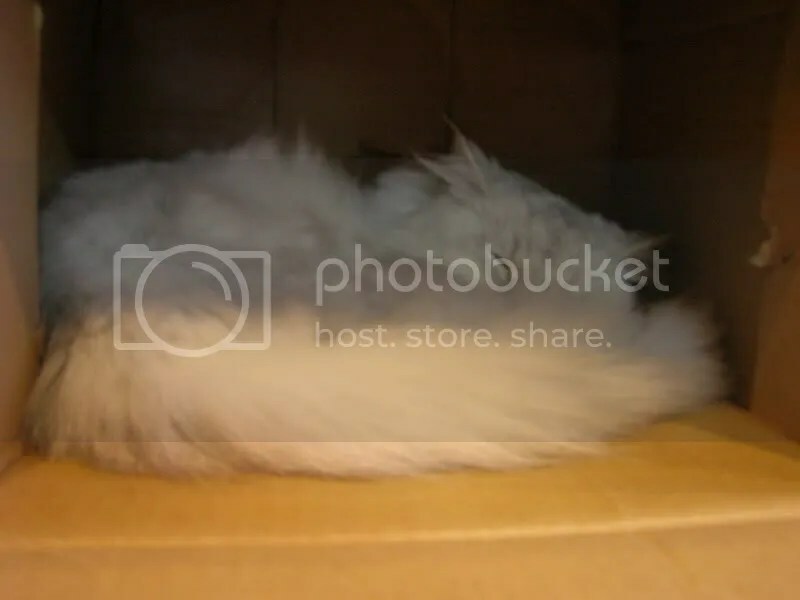 I have to admit I’d pretty much given up on traveling to Tokyo to see one, when my host family showed me an article in a lifestyle magazine – a cat cafe had opened in Nagoya and I had made my interest in cats sufficiently visible that they were willing to take me one weekend. 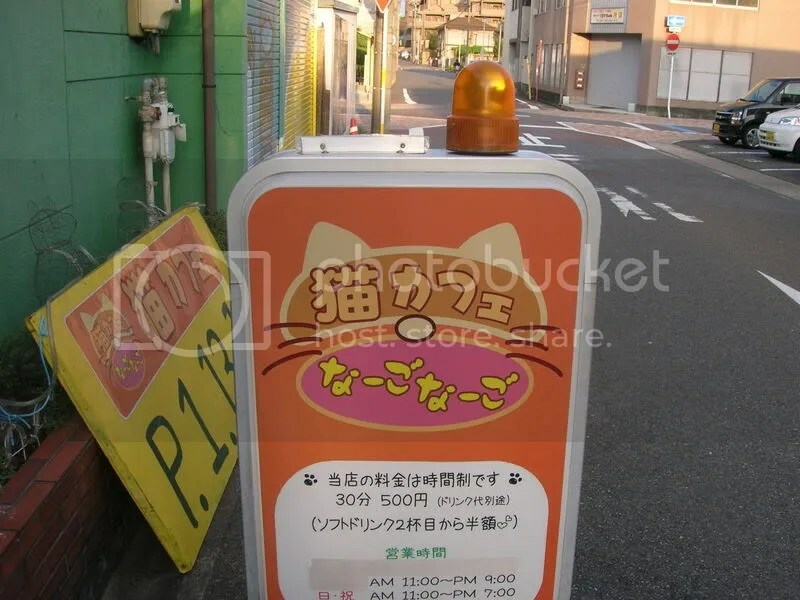 This is the outside of the cat cafe – it’s in the same ward** as my university, but apparently hard to get to by subway. I’m trying to work out a way of getting there that doesn’t involve a card, since I’d like to go back when my dad visits in November. 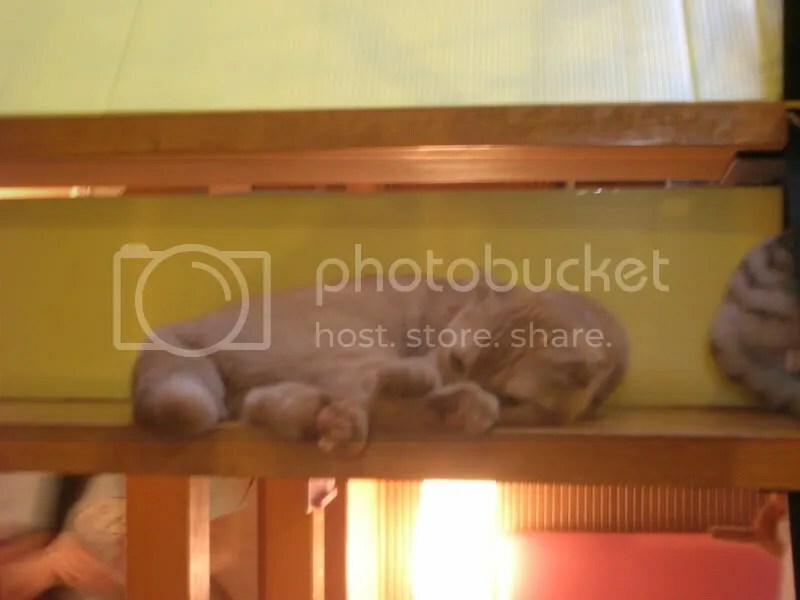 The name of the cafe was Cat Cafe Nago Nago. 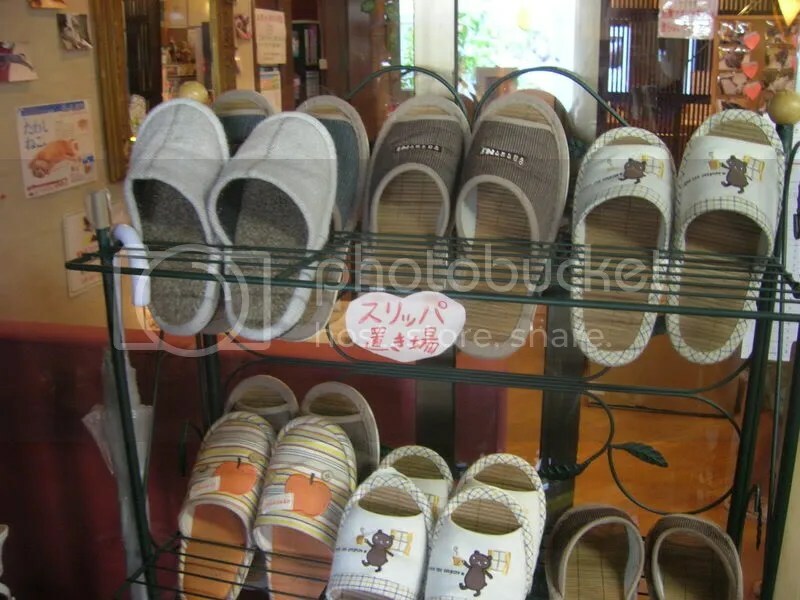 Everyone who entered was required to take their shoes off and put on slippers. I’ll let this one and the few speak for themselves. Above is Kotora (koh-toh-rah, probably meant to be ‘little tiger’). 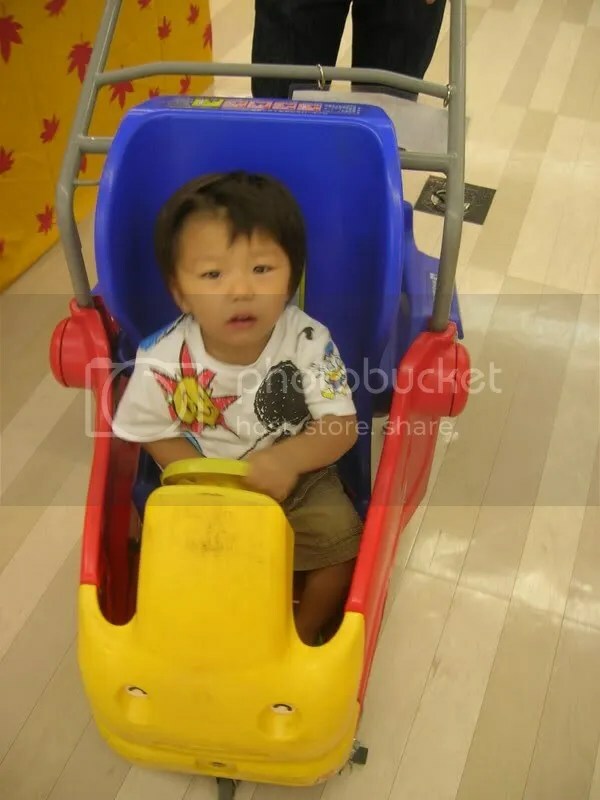 He is four years old and his tagline is ‘loner.’ Below is Tan (tahn), a ten-month-old male who loves toys. This dude was up on a pretty high shelf – high enough that putting my camera up there and stretching for the button was the only way I got a look at him. His name is Potechi (poh-tay-chee) and he is two. He is, apparently, the coward of the bunch. 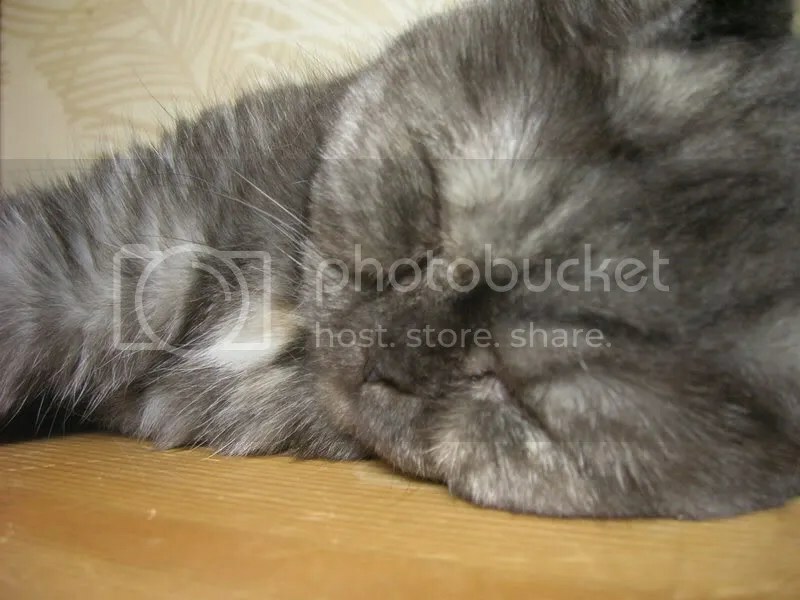 This is Tawashi, the only cat whose name I remember. I’ll try and find the magazine so that I can name the others. Tawashi is seven months old, the zoungest out and about kitty. 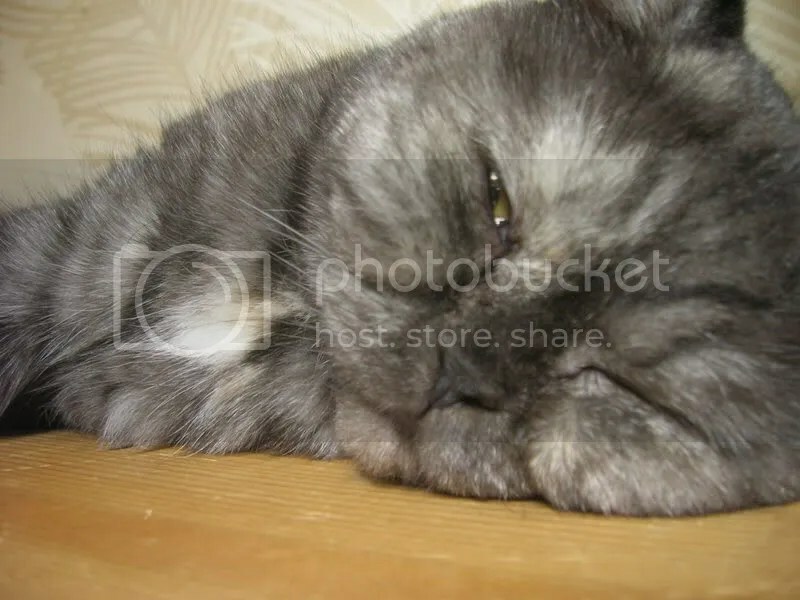 He is labelled as the Idol, the grouchy, persnickety one of the bunch. 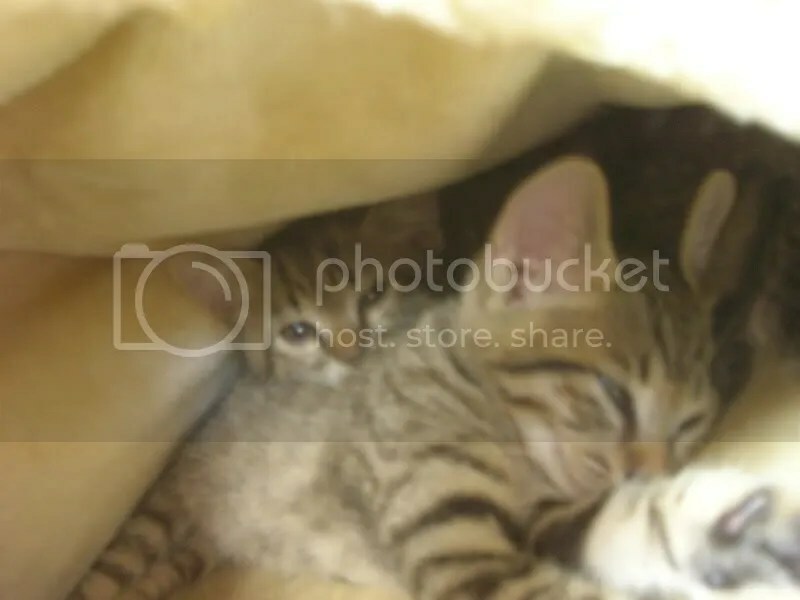 The kittens were ridiculously cute – tabbies, but their pattern was slightly different from any tabby I’ve seen in the States. They were a little difficult to photograph in the cage, moving around a lot to get away from the giant faces looming in to look at them. I would have taken more pictures when they were let out, but at that point I was ready to set the camera down and do some cuddling. This is my host family’s kid and he’s in the doghouse this week for breaking my camera and body slamming my knee. The camera is being replaced and I’m sure my knee will recover, but it was not a good Japan-USA Foreign Relations week. ** Japanese cities (for the most part) have the suffix ‘-shi’, meaning city. They are divided into ‘ku’ or wards. 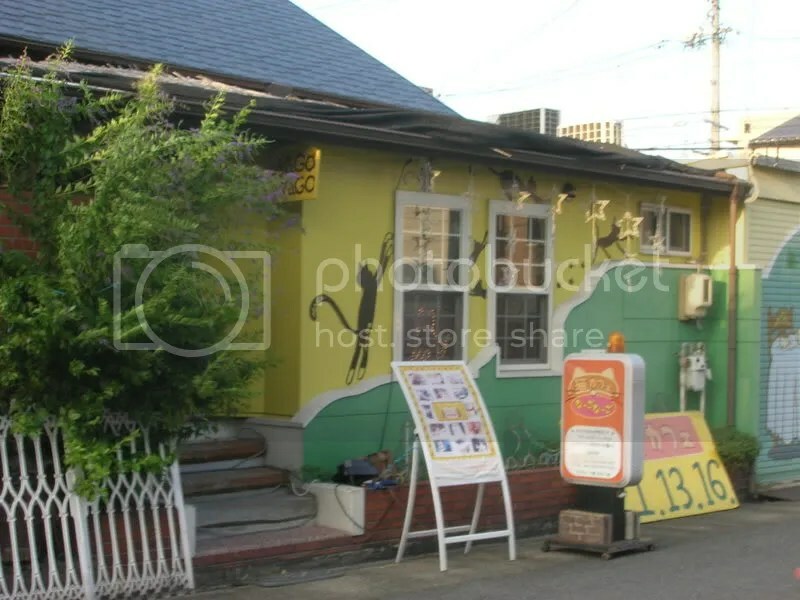 I live in Kita-ku (North Ward), while the university and the cat cafe are in Showa-ku. Ku are further subdivided in ‘cho’ or towns. From there numbers are used on buildings, but that can be a pretty hairy way of finding things. PS First round of postcards is going out today. I’m doing two a week and bought the postcards for these two weeks in Kanazawa over the weekend. PPS My new site banner is a photo I took from the top of my host family’s building (they live on the first floor).